SSI ML-1 Magnetic Locator – Utility Mapping Services, Inc. The ML-1 is one of SSI’s longest-enduring and popular products for magnetic detection. 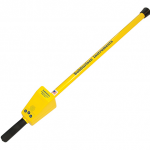 This tool can be used to find corner markers (iron or steel), well casings, steel drums or septic tank handles, etc. The ML series offers simple one-handed operation with an easy-to-learn keypad featuring only three buttons – no menus or cumbersome instructions to follow. The audio unit has the volume built into the on/off key; just hold down the key while it cycles through the settings. The ML-1 features strong monotube construction, providing structural integrity.